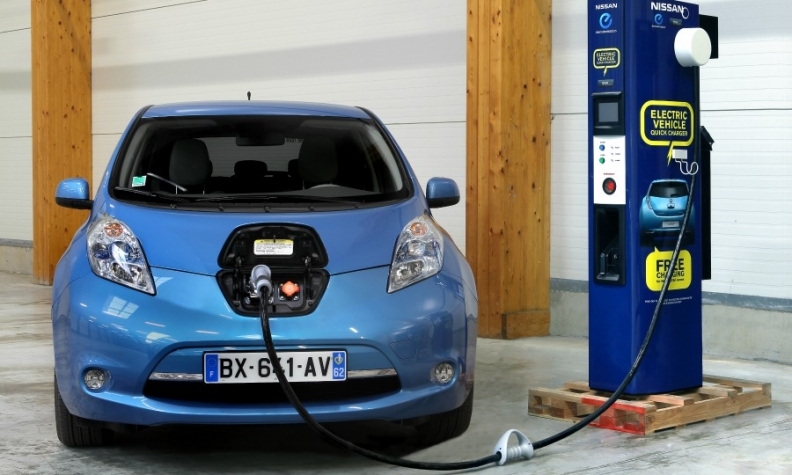 Automotive Energy Supply Corp. builds batteries for the Nissan Leaf. The automaker has a majority stake in the unit. HONG KONG -- GSR Capital, a Chinese private equity firm with backing from the Hubei provincial government, is nearing a deal to acquire control of a Nissan Motor Co. rechargeable battery unit for about $1 billion, according to people with knowledge of the matter. The firm is in advanced talks with Nissan about buying a stake in Automotive Energy Supply Corp., which makes the lithium ion cells for the Japanese company's Leaf electric car, the people said. The parties aim to announce an agreement within the next two weeks, said the people, who asked not to be identified because the discussions are confidential. The Hubei government-backed Yangtze River Industry Fund is contributing at least 20 percent of the GSR Capital fund doing the AESC deal, the people said. Nissan owns 51 percent of AESC, while NEC Corp. holds the remainder. GSR Capital sees value in building an independent battery supplier to multiple automakers and is considering moving some of AESC's manufacturing to Hubei, the people said. The central Chinese recently earmarked 547 billion yuan ($80 billion) for investments in areas like clean energy to modernize its economy. "This deal would bring huge benefits to both sides," said Takeshi Miyao, an analyst at Tokyo-based market researcher Carnorama. "China is planning to manufacture batteries in the country as they encourage use of electric vehicles and AESC would be a perfect target as it has good battery technology." Sizeable Chinese acquisitions of Japanese assets are rare, with transactions this year totaling just $11.4 million, according to data compiled by Bloomberg. Last year, Japan attracted less than $700 million of deals from firms based in Asia's biggest economy, the data show. There's no certainty the talks will lead to a transaction, and another buyer could still emerge. Nissan said in an emailed statement it's committed to producing the best electric vehicle solutions and continually evaluates its business strategy in pursuit of optimal products and business structure. Representatives for GSR and NEC declined to comment, while the Yangtze River Industry Fund didn't respond to emailed queries. GSR Capital is led by Chairman Sonny Wu, who has fronted several attempts at multibillion-dollar overseas purchases. Wu pursued acquisitions of Osram and Royal Philips’s lighting unit last year, people familiar with the matter said earlier, though in both cases the discussions didn't lead to a transaction. Another deal he spearheaded, the $2.8 billion takeover of the Philips Lumileds business by his GO Scale Capital fund, was blocked by a U.S. security panel. Wu's funds have invested in Lattice Power Corp., which is developing cheaper and more efficient LED chips, and Chinese electric-car maker Xin Da Yang. GSR Ventures is also a backer of Boston Power, which builds lithium ion batteries for electric cars and buses. Global automakers have been seeking to make inroads in China, the world's biggest electric-vehicle market. The Chinese government has required EV producers to choose from a list of approved battery vendors, all domestic makers, to receive subsidies. Nissan and NEC established the battery unit in 2007, more than three years ahead of the Leaf's introduction. The Japanese automaker has been selling stakes in businesses including parts manufacturer Calsonic Kansei Corp. and forklift truck maker UniCarriers Corp. to focus on developing technology including electric powertrains and autonomous driving. Nissan is also looking to push into Southeast Asia with its purchase of a stake in Mitsubishi Motors Corp.